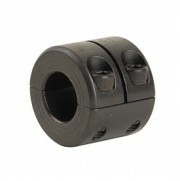 We carry a two piece shaft collars in a range of different materials available off the shelf. Two-piece clamp style collars offer the same benefits as the one-piece collars with additional versatility and convenience. They are easily disassembled, reducing labour and downtime when adjustment, removal or replacement is necessary. Ruland keeps both halves of its two-piece collars together throughout the manufacturing process to assure a perfect match for proper fit, holding power and alignment. 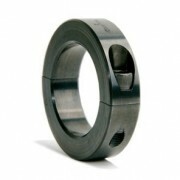 Ruland’s double width collars are available in one and two piece clamp designs in steel and stainless steel. Clamp style collars wrap around the shaft, providing high torsional holding power without the shaft damage and fretting that occurs when set screw style collars are used. Two-piece clamp styles also allow for disassembly and maintenance without removal of other machine components and feature opposing hardware for a balanced design.